I greatly respect people who keep their blinds drawn open. That’s how we live. 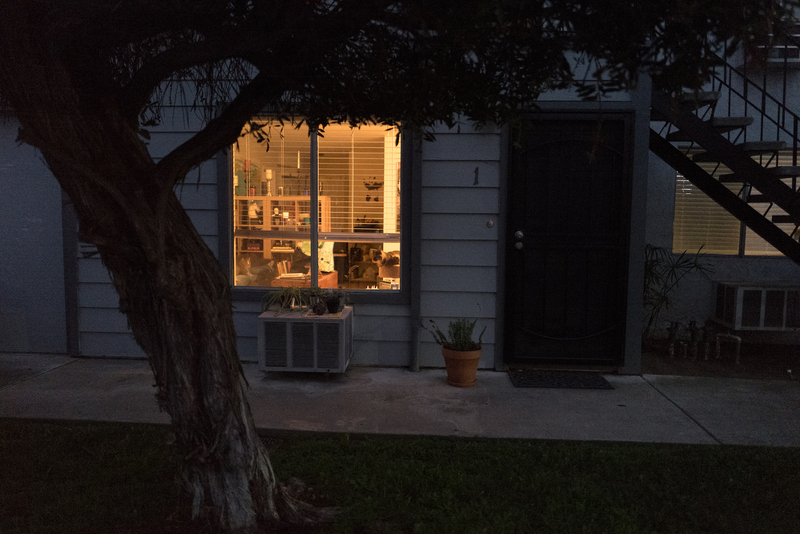 Pretty much anyone can see in any of our windows anytime of day or night—not that I invite you to step up and gawk. What’s the point of all that glass if you can’t look out or let the outside in (eh, like sunlight)? This series features a number of felines sitting inside windows, staring out: Cool, Curious, Glass, Kit, Seeker, Star, Still, and Watcher. Open blinds reveal, in the windows’s lower right side, a handsome tiger sitting on a cat tree. Another relaxes on the sofa. Their owners earn my praise for enabling the furballs to look out. Good for them! At first glance, the Featured Image would seem like a poor choice for inclusion: The cats aren’t crisply seen; the image’s texture is noisy; and the view through the window is somewhat revealing. But for all the faults, something about the composition and contrasts—coupled with my own predilections about openness—is appealing. I can’t resist. Something else: These must be indoor beasties, whom I likely will never get to photograph outside. I feel strongly to include them. That said, if not for a mistake made with the Leica Q settings, I could be inclined to discard the photo, shot on Nov. 30, 2017. I had been out looking to photograph cats on the street and had arbitrarily set shutter speed at 1/125 sec to avoid motion blur when shooting at wide aperture and auto ISO. By the time I came to this domicle, 5:06 p.m. PST, the sun was gone more than 20 minutes but dusk had come early because of clouds. An auto-set slower shutter speed likely would have produced, with lower ISO, a much clearer portrait. Artistically, I find that the grainier shot imbues more compelling ambiance while diminishing detail revealed inside the brightly-lit room. Out of respect for the cat owner’s privacy, I reduced the photo’s size to limit how much can be meaningfully seen beyond the twain; additionally, location isn’t disclosed, as typically would be done. Vitals: f/1.7, ISO 10000, 1/125 sec, 28mm. More feline friends: Scruffy, Roly Poly, Woo, Skull, Biscuit, The Colonel, White, Chipper, Frisky, Stretch, Needy, Farfisa, Mates, Hunter, Pee-Pee, Blue, Blue Too, Bonded Pair, Patience, Fess, Jumper, Frenemy, Looker, Cozy, Scout, Lurks, Skit, Mini, Betty, Black and White, Stalker, Bell, Chill, Sammy, Scratch, Poser, Star, Grey and White, Watcher, Herman, Comet, Roman, Willow, Chub, Nimbus, Watson, Lilo, Kit, Pepe, Twilight, Sebastian, Spot, Booger, Ash, Veruca, Riley, Mellow, Bonde, Flower, Glass, Black, BeBe, Fang, Bruce, Siamese, Pounce, Tortie, Haiku, Fraidy, Peso, Daniel Tiger, Dusk, Stride, Dainty, Spry, Tabby, Betty Too, Still, Levi, Shadow, Sophie, Wink, Ferals, Momma, Charlie, Tux, Cool, Benny, Jellicle, Itchy Valentino, Goldie, Nine, Amanda, Siesta, ChaCho, Charlie, Too, Mika, Crystal, Seeker, Mittens, Dancer, Smokey, Monkey, Captain Blackbeard, Season, Maven, Tink, Chunk, Curious, Hanoi, Bella, Tarry, Guido, Maxine, Mr. Kitty, Peohe, Panda, Frankie, and Sunshine.